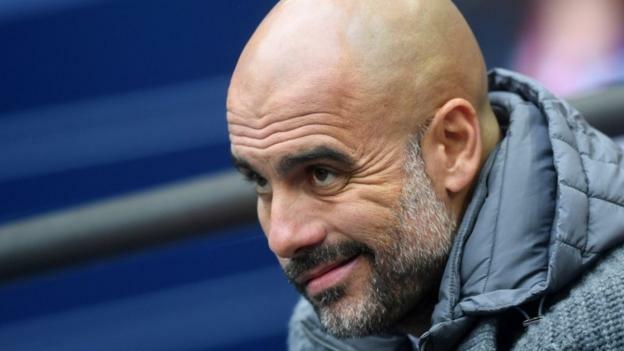 It will be “almost impossible” for Manchester City to win the quadruple this season, Pep Guardiola has said. His City side beat Brighton 1-0 on Saturday to reach the FA Cup final. They have already won the Carabao Cup, are in the Champions League quarter-finals and are currently second in the Premier League as they attempt to become the first English club to win all four trophies in one campaign. “Surviving is a miracle. It’s nice to be there,” the City manager said. City were below their best against Brighton, but Gabriel Jesus’ early goal saw them reach the FA Cup final for the first time during Guardiola’s reign. The closest any English club has come to winning all four trophies in a season was Manchester United when they won the Treble – the Champions League, Premier League and FA Cup – in 1998-99. They remain the only side to have achieved that feat, but Sir Alex Ferguson’s team went out of the League Cup in December 1998 and so missed out on a shot at the quadruple. “Do you believe we can play 60 games and give a fantastic performance every time? No team can do that,” Guardiola said. City’s attention now turns to the Champions League on Tuesday, when they play Tottenham in their quarter-final first leg at Spurs’ new stadium. How difficult is it to win the quadruple? Only two other English teams have still had the chance of winning the quadruple at this stage of the season: Chelsea in 2006-07 and Manchester United in 2008-09. Managed by Jose Mourinho, Chelsea’s hopes of a clean sweep lasted until 1 May, but they lost to Liverpool on penalties in the Champions League semi-finals. They did win the FA Cup and League Cup, but went on to finish second in the Premier League. Two years later, Ferguson’s Manchester United made it to 19 April before their dream ended with a penalty shootout defeat by Everton in the FA Cup semi-finals. They won the Premier League and League Cup, but were losing finalists in the Champions League. Last season, City, who broke a series of Premier League points and scoring records on their way to the title, were fighting on four fronts until 19 February before losing to Wigan in the FA Cup. Celtic are arguably the only team in Europe to have won the ultimate quadruple of domestic trophy, European Cup and both domestic league cups. They picked up the Scottish First Division, European Cup, Scottish Cup and Scottish League Cup in 1967. Guardiola’s insistence that it is “almost impossible” to complete the clean sweep of Premier League, Champions League, FA Cup and League Cup is perfectly understandable expectation management. And yet you have to be in it to win it, and Manchester City remain firmly on course for history after a scrappy FA Cup semi-final win over a resilient but limited Brighton. City struggled to impose themselves for long periods, groping to find their most fluent form and failing to string together those glorious attacking passages that are their trademark. The job, however, was done and completed with only one serious alarm despite Guardiola’s side being off colour. No team, even one as special as Manchester City clearly are, can win full marks for artistic impression every time, a point Guardiola was keen to make and one it is impossible to disagree with. The four-trophy haul has remained out of reach of all the great English sides. It is a test of endurance and consistency that requires quality, resilience and good fortune along the way. All the pieces must be in place for most of the campaign. It would be a remarkable achievement and the odds remain against City – but equally you would not back against them either.